Leupeptin, is a microbial product, isolated and carefully purified as hemisulfate. Leupeptin is a competitive transition state inhibitor and is mainly used as inhibitor for serine proteinases like trypsin, plasmin and kallikrein. It inhibits cysteine proteinases like papain and cathepsin B. Leupeptin does not inhibit thrombin or α-chymotypsin. The tripeptide aldehyde is highly soluble in commonly used buffers containing Water, Ethanol, or DMF. Leupeptin will be used very often in combination with Pepstatin A in protease inhibitor cocktails like “Mito Buffer” or “TNC Buffer”. The purity of the tripeptide aldehyde Leupeptin cannot be determined by HPLC or TLC due to three tautomeric isomers, which will be separately detected. Our product Leupeptin will be shipped at room temperature. Information about product specific storage conditions will be found on the vial. Please avoid repeated freezing and thawing by preparing aliquots. 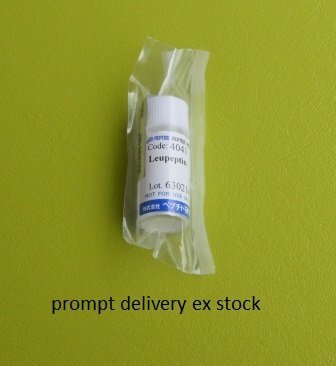 Aqueous stock solutions of Leupeptin are usually set up with a concentration of 1 mg/ml and should be stored at -20°C. Storage of stock solutions of Leupeptin at 4°C are possible for approx. 1 week.